With warnings of impending snow last Thursday evening, Charity GIFT was understandably nervous that volunteer drivers would cancel their usual deliveries and that food packages wouldn’t be delivered; potentially leaving hundreds of GIFT households without challot and essential food for Shabbat! WhatsApp, email messages and Facebook requests went out; and gratefully members of the community responded! 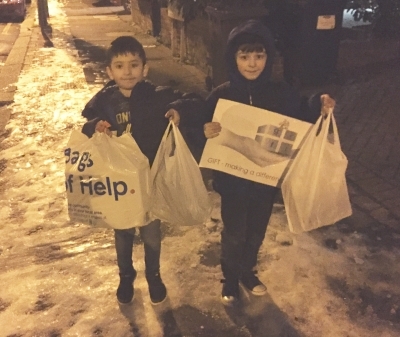 When GIFT volunteer Arnold Aaron saw the message, he asked his children Joshua and Jonathan, aged 6 and 8, whether they were up for volunteering and they jumped at the opportunity to volunteer in the snow! - especially as their schools had been cancelled. GIFT wishes to thank all its dedicated staff, committed volunteers and members of the community for their incredible enthusiasm and devotion, ensuring all the food packages reached their destinations and enabled those most in need in our community to receive their Shabbat provisions.